The blufer's shell is stout, inflated, oval to rectangular, and thick with a posterior wing; round anterior end and broadly rounded posterior ridge; posterior end bluntly squared (females) to sharply rounded (males). Umbo is broad and raised above hinge line. Epidermis is smooth and glossy, dark brown, becomes black with age; dark green rays on young, later fading. Inside shell beak cavity is broad and deep; pseudocardinal teeth relatively small, roughened, and pointed; lateral teeth prominent, blade-like and slightly curved; nacre (lining) pinkish-purple to deep purple. Similar species: Pink heelsplitter is lighter in color and less inflated or stout, and its nacre is lighter in color. Medium to large rivers with reduced current in a stable mix of mud and silt or mud and gravel. 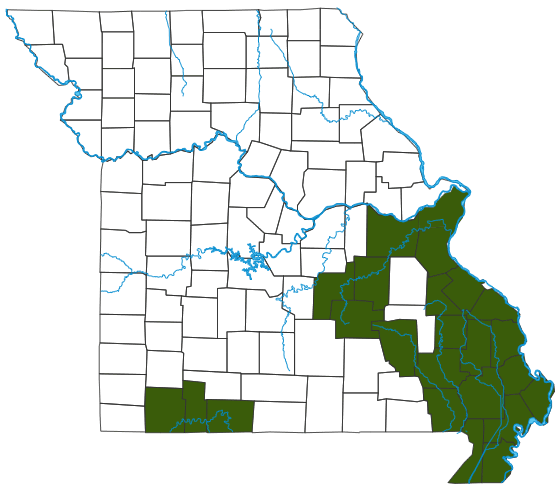 Restricted to the Lowland Region in flood control ditches and in White, Black, St. Francis, and Mississippi river tributaries. Males release sperm directly into water. Females downstream siphon sperm into the gill chamber, where eggs are fertilized. Eggs mature into larvae (called glochidia), which discharge into the water and attach to host fish — in this species, the freshwater drum. The tiny mussel eventually breaks away and floats to the bottom of the stream, and the cycle repeats. Mussels are excellent biological indicators of water quality because they are long-lived and relatively immobile, accumulating contaminants in water that can be scientifically analyzed. Because of its purple (not white) nacre, the bluefer was not used in the button industry.